Polymeric materials are widely used in many commercial applications due to their properties: mechanical and thermal resistance, low thermal and electrical conductivity, corrosion resistance, and flexibility in transparency, chemical inertness, etc. However, in some applications necessary for certain surface properties (wettability, adhesion and biocompatibility) of these materials. One way to modify the surface properties of polymeric materials is the cold plasma treatment. In these surface treatments, the interaction between the plasma and the material exposed change only the surface properties of the material, the effects are limited to a depth of only a few molecular layers, leaving unchanged the bulk properties of the respective material. The surface properties of polymeric materials are important and used in many applications such as: everyday applications in industry (food packing, adhesion, printing, electrical conduction, etc. ); in biomedical field (drug delivery devices, cell culture, dental materials used in prostheses manufacturing, urinary catheters, etc.). For changing the wettability of polymeric materials using two types of atmospheric pressure cold plasma sources, namely by a dielectric barrier discharge (DBD) and a discharge with bare electrodes (DBE). Working parameters for the two cold plasma sources were: RF power 14 W, argon flow 4500 sccm, and the distance between nozzle and substrate was 2 mm. 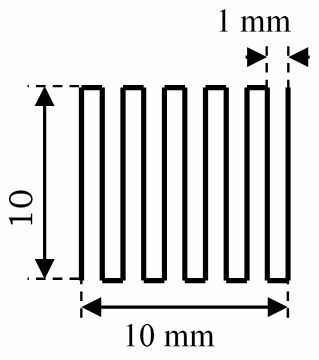 To ensure a uniform treatment of the surface using a well-defined path shown in Figure 1. 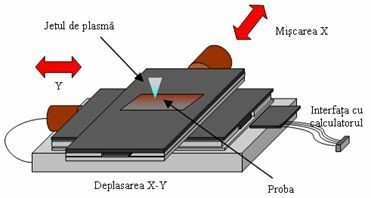 Treatment of polymeric surfaces has been carried out by exposing the polymer film, placed on an x-y translation stage, in the plasma jets generated in DBD and DBE configuration (Figure 2). i) Treatment of polymeric materials to increase the wettability. The results obtained use DBE and DBD plasma sources in surface modification of polymeric materials are presented in Figure 3 and Figure 4. After treatment with cold plasma was obtained surfaces with hydrophilic behavior. 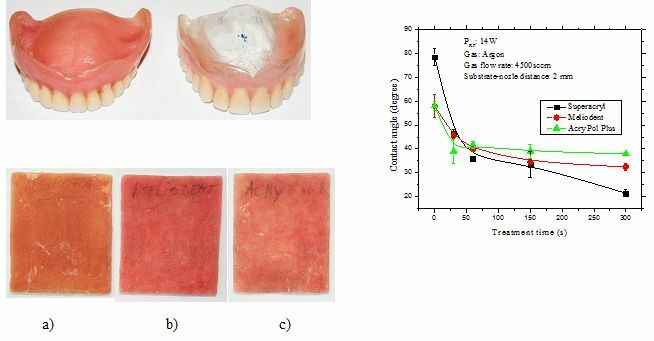 ii) Results on the surface modification of polymeric dental materials used in prostheses manufacturing. After atmospheric pressure plasma treatment it was observed an increase of wettability. A better wettability of the prosthesis surface enhances the adhesion and increases the patient comfort. iii) The behavior of epithelial cells in contact with the polymeric material treated in the atmospheric pressure plasma. The polymeric material used for this experiments was PTFE (polytetrafluoroethylene). 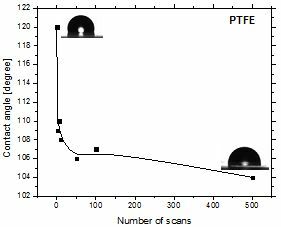 It is observed that on PTFE regionally selective adhesion of epithelial cells in plasma treated zones is promoted.